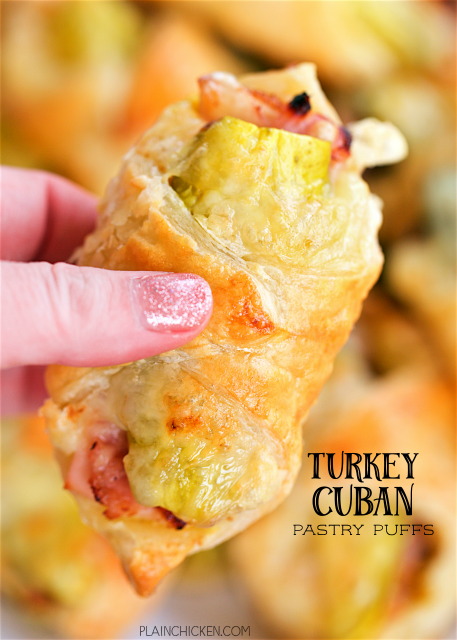 Turkey Cuban Pastry Puffs - great way to use up leftover turkey! SO delicious! 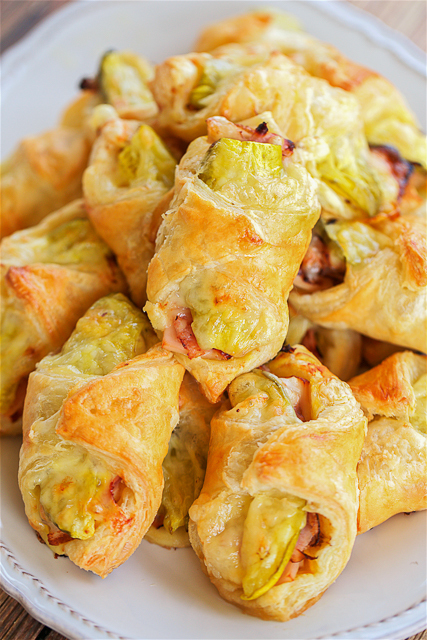 Puff pastry filled with mustard, turkey, ham, swiss cheese and pickles. Can make ahead and freeze unbaked. Great for parties, tailgating, lunch or dinner. These taste FANTASTIC! A traditional Cuban Sandwich has pork, ham, pickles, Swiss and mustard. Since we have a lot of leftover turkey from the holiday, I decided to swap the pork for turkey and wrap it all in puff pastry. Let me tell you, these Turkey Cuban Pastry Puffs were DELICIOUS! One bite and we were both in heaven! These Turkey Cuban Pastry Puffs can be made ahead of time and frozen. If you freeze them, let them thaw for about an hour or so before brushing them with the egg wash and baking. These are perfect or a quick lunch or dinner, tailgating or your upcoming New Year's Party! Spread about 1/2 tsp of yellow mustard over the puff pastry. Arrange turkey slices down diagonal center of pastry squares. Top with ham, pickle slice and swiss cheese. Fold two opposite corners of each square over the filling and press edges to seal. Place on prepared baking sheet. Making these for a snack tonight. Thanks so much for the recipe. They look delicious and were so easy to put together!